Brenda Bartelink, researcher in our research team, has obtained a grant for a research and design project in which the stories of African-Dutch women are central. The lives and bodies of African-Dutch women in the Netherlands are often discussed in terms of problems around female circumcision, rushed or forced marriages or particular health risks these women experience. Yet the voices of women themselves are often absent of these discussions. This project is interested in women’s narratives about health, well being and the body. 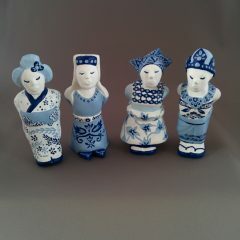 In this project Africa-Dutch women in the city of The Hague are invited to narrate and visualize their stories through the crafting of typical Dutch Delft Blue figurines. The project was inspired by a collaboration between Brenda Bartelink, designer Gabriela Bustamante and Lerina Kwamba from Kariboe Bibi, an organization of and for women from African background in The Hague. Together they want to contribute to making African Dutch women visible in and heard in a positive manner. For more information, please read the news item (in Dutch) on the website of the University, and visit this websites for updates on the project.